Drobo has just started shipping a new storage system (in fact mine’s already on its way to me). 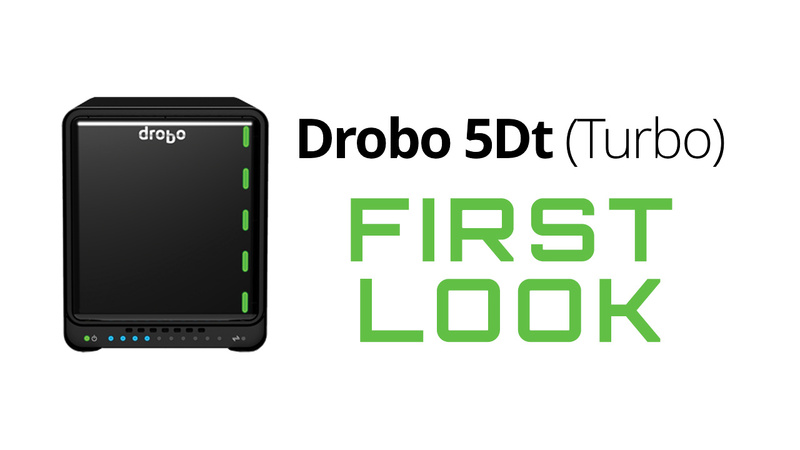 Drobo announced the DROBO 5D Turbo Edition also know as the Drobo 5Dt. I’ve recently had several talks with the company’s CEO and leadership team, and they’ve assured me that they’re laser-focussed on building tools for photographers and video pros. These is the first unit in that offering. What is the Drobo 5Dt? Drobo is offering a souped-up version of its popular 5D RAID system. Here’s what’s improved over the original Drobo 5D. Volume capacity of up to 64TB. Currently drives are shipping around 8TB, but you can swap out drives on your own one at a time to upgrade in place. I just bought a bunch of 5TB drives as they are cheap and affordable right now, but have will also add in some 3TB drives that I had laying around. You can mix and match drives with the Drobo easily. As drives get even bigger, the Drobo can create multiple volumes if needed. Ability to connect via Thunderbolt 2 and USB 3.0. While Thunderbolt 3 and USB3 are released, these are not widely available or very popular yet. Thunderbolt 2 work with both TB1 devices natively and TB3 with an adapter. USB3 also works with a lot of Macs and PCs. Cables are also included (a nice touch). Optimum pass-through for Thunderbolt. If you’re using a 4K monitor via Thunderbolt or DisplayPort, that will work with this Drobo. Hot Data Cache Accelerator Bay with MSATA Card. Drobo includes a 128GB mSATA/SSD. Your most recent files and active images will cache here for even faster performance. Get SSD speeds while using traditional drives. The cache can deliver speeds of up to 20 Gb/s. These leads to an average of 3X faster performance for cached files (such as opening your Lightroom Library). Boosted Performance.. The Drobo’s typical performance is around 540 MB/sec Read & 250MB/sec Write with traditional HDDs. Devices like G-RAID Studio offer 360 MB/s read and G-RAID Thunderbolt is 480 MB/s read. The Drobo is a key part of my data protection workflow. I still advocate for a true 3-2-1 Backup strategy. This means that you have two copies of your data local (two physical drives or RAIDs) it also means 1 offsite (in the Cloud or on a removable drive offsite). But the Drobo makes it even less likely to fail. BeyondRAID Virtual Architecture. Data is stored on multiple drives in the Drobo. You can set up so a single or two drives can fail with no data loss. Warnings on Drive Failure. Get an email alert when a drive fails. Easy repair. Installing a new drive takes 3 seconds. No tools are needed. My 9 year-old son has even done it. Protection from Power Loss. There’s a battery backed cache and eUSB. If power is lost the data will complete writing or it will store it and write it when the unit is powered back on. Data Scrubbing. The Drobo searches and repairs files. While it runs it looks for damaged files and then it can restore from its backup and close out the bad sectors on the disk. Drobo has gotten a lot of grief for its support department in the last two years. I met wit the company and talked with the new head of support. Major changes have been made and support appears to be back on track. This Drobo comes with an excellent warranty and boosted service. 3 Year DroboCare Included for Free. This means a 3 year hardware warranty. Advance Drobo Replacement. If you’re unit needs to be replaced Drobo will express ship you a replacement. Drobo will cover all shipping (both to you and the return of the failed unit). My unit is on its way, so I’ll have a proper field test soon. But I’m truly glad that Drobo has gotten back to its roots of focussing on tools for creatives. I also think expanded warranties and improved support are a great sign that the company is recovered its focus on what demanding users need. I’m glad to see that the company is back on track. I’ve never lost data off a Drobo, but I have had occasional support issues (we have about 25 Drobos in use across our studios). The company has always gotten things working, but now longer warranty coverage is a great piece of mind. It’s on its way… arrives in about a week. can you write a review of the product. or give me an update if it is worth buying. And your thoughts on the 5Dt, Richard? Looking to hear your thoughts now that you have had it awhile. I own one but my iMac only has Thunderbolt and not TB2. Wondering how fast it is with those using TB2.